Making better video games, so you don't have to. Technnopop was founded by Randel Reiss in 1990 and incorporated in California in that same year. Technopop became Sega's very first U.S. independent developer for the Sega Genesis and created most of the early development tools used by Sega Genesis developers. Technopop has designed and developed award winning video game titles such as Zero Tolerance (1994), Beyond Zero Tolerance, and Spider-man (1991) for the Sega Genesis, 32X, and SegaCD. Thumbelina (1995) and The Emperor's New Clothes for the PC and Macintosh. Point of Impact for the PC, Williams Arcade Classics for Microsoft Windows (1996), and the MacSlueth utility software application for the Macintosh. U.S. localization for Yoot Tower (1996), the sequel to Sim Tower, for Microsoft Windows and Macintosh. Technopop's unique focus on the production pipeline process itself is why its products still receive top reviews. Technopop's partners and associates include Scott Haile, Justin Wolf, Satoe Ishii-Haile, Tony Ramos, Lasse Faabeng, Thomas Gjoerup, Desmond Crisis, Jo Ellen Reiss, Russel Reiss, Dezso Molnar, Sheryl Knowls, Karen Quest, Phillip Temple, Suzzie Green, Jenny Martin, Gary Jones, Gale Uk-odom, Patrick, Sharon Cho, Stephen Heiser, Curtis Karnow, Brandon Maloof, Steve Hanawa, Jeff Dubrow, Burt Sloan, Mark Miller, John Miller, David Foley, Eric Knight, Dave Yee, and Paul Puey. Zero Tolerance ROM Image Zero Tolerance was the very first, First-person Shooter (FPS) for any video game console. Randel Reiss, the owner of the Zero Tolerance copyright and trademark, has made the original Zero Tolerance Sega Genesis ROM image royalty-free for distribution. Portions of the ROM image are copyright Sega and although Sega has not actively prevented royalty-free dsitribution, they have never official granted permission for distribution. Zero Tolerance was also the very first video game console game to allow two game consoles to be networked together with Technopop's unique, proprietary, 2-player Network Link Cable. The Technopop 2-Player Network Link Cable was offered for free with any purcahse of the Zero Tolerance game. 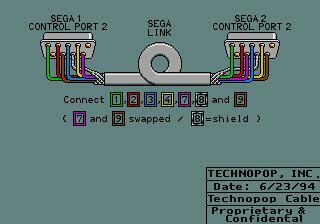 The cables are no longer available, but to the right you will see all the necessary wiring for making your very own, first ever, 2-player Network Link Cable for the Sega Genesis. Unfortunetly due to incompatibilites Sega designed into the Nomad portable game device, the cable will not work on the Nomad.